Fatah officials called on all "Palestinian" organizations to take part in a protest on "Palestinian Prisoners' Day," which falls on April 17. In a notice the terror organization published in honor of the fifteenth anniversary of terrorist Marwan Barghouti's death, Fatah wrote that Barghouti continues "to be a torch lighting the way for our continuous struggle." 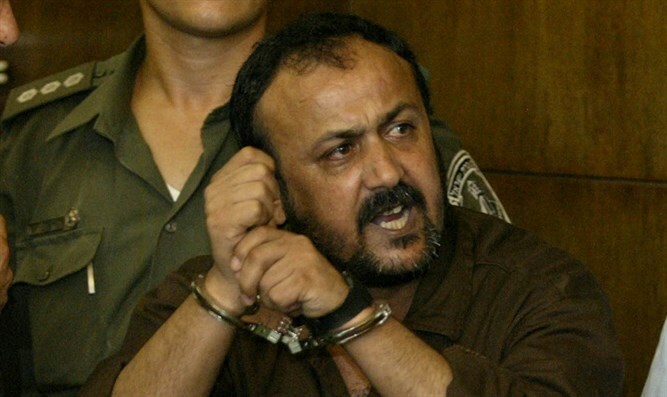 They also wrote that Barghouti "is involved in the protest of the heroic Palestinian prisoners." Islamic and Palestinian Authority forces in Ramallah, as well as the High Follow-Up Committee for Arab citizens of Israel, called on the Arab community to show solidarity with the imprisoned terrorists, who will begin a hunger strike on April 17. A central event will be held in Ramallah's Yasser Arafat Square. Other protests will be held in various central Arab cities, in Judea, Samaria, and Gaza. Every year, "Palestinian Prisoners' Day" protests turn into violent clashes with the IDF after Arabs begin rioting.